Last year's Christmas pick was the warm-hearted swingin' spirit of Brian Setzer, with his hard-drivin' horn-blowin' version of Xmas classics. This year's pick, while flirting with the outre, is painfully appropriate for the times--making it an obvious choice. In promotion of the forthcoming Zweng album, Silent Scream of Gulls, he's released a holiday track in the spirit of the season at Xmasisacrime.com. Zweng commands a cult of personality which shows in the track. For a sneak peak of the new album, take a look at Futher South, a song capturing Zweng's delicate style while showcasing his penchant for the diabolical. Cheers to Xmasisacrime. In a win for health advocates and opponents of underage drinking, MillerCoors announced last week that will voluntarily remove the caffeine, taurine, and guarana content from its Sparks energy beer. The company is also agreeing to pay $550,000 to the National Association of Attorneys General to cover their cost of the investigation into the health effects of their concoction. The investigation found that not only is the alcohol-caffeine mix deleterious to one’s health, but that college students who mix alcohol and energy drinks were more likely to be hurt, sexually assaulted, or drive drunk than those who only drank alcohol. What happens when you take the caffeine, taurine, and guarana out of your beer? I know the answer and it’s not what MillerCoors wants to hear. After plunking down $215 million dollars for the Sparks and Steele Reserve brands (created by the San Francisco-based marketing and beverage development firm, McKenzie River), I wouldn’t be surprised if they were dusting off the guillotine out in Milwaukee. 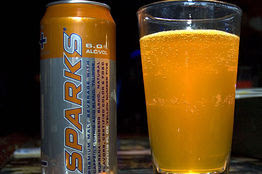 From 2003 to 2005 Sparks purportedly grew sales at 107% annually, a blistering growth rate that was fueled by popularity among entry-level drinkers and females. What is surprising about all this is that Miller failed to foresee the current public policy climate and that marketing to underage drinker would indeed be frowned upon by law enforcement. McDonald's recently launched an aggressive advertising campaign aimed at converting Starbucks customers. Focusing on Starbucks' home turf of Seattle, the burger giant has strategically planted a whopping 140 billboards placed near Starbucks locations. Beckoning loyal coffee drinkers to save a few bucks and get their espresso from Ronald McDonald instead, the new ad campaign is an aggressive move designed to promote McDonald's foray into the premium coffee market. In a concept dubbed "McCafe," McDonald's has attempted to recreate their own version of the Starbucks experience, offering highly caffeinated espresso-based beverages in a cafe setting to their BigMac-munching clientele (translation: eat BigMacs faster). With 47 million customers walking through their front doors daily, the the McCafe concept will no doubt succeed in the short run by helping the burger behemoth squeeze a few extra bucks out of each customer, but those customers probably wouldn't have gone to Starbucks anyway. By increasing category awareness for lattes, cappuccinos, and macchiatos, McDonalds is raising a new breed of Starbucks customers who otherwise might not have felt comfortable enough to order an Italian-style beverage. 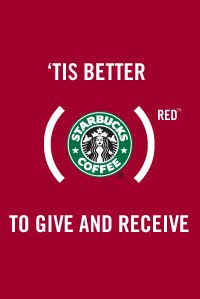 Starbucks announced today that in honor of the World AIDS Day 20th anniversary, the company will donate a nickel for every beverage purchased on December 1st to the Global Fund. Starbucks CEO Howard Schultz explained, "Now more than ever, it is important to continue to be a responsible global company. We have a deep partnership with coffee growing regions in Africa and are proud to partner with our customers to contribute toward an AIDS-free Africa." Howard is absolutely right that Starbucks is a responsible company and they have a vested interest in peace and health on the African continent. The company has a great record for sustainable business practices, with the most obvious example of providing health insurance to the vast majority of their 143,000 employees (you even get insurance if you work part time at Starbucks). But is this whole RED thing really going to make a difference or is it just a clever marketing lever used to juice up sales? My calculations show that on December 1st Starbucks will likely donate a mere $300,000 to the Global Fund at the going rate of 5 cents a drink. This is a drop in the bucket compared to the nearly $15 billion that the Global Fund has deployed to combat AIDS and also only 0.07% of Starbucks' annual general and administrative costs. When will marketers realize that lightweight partnerships with humanitarian and green causes dilute the honesty of a brand and sow customer distrust and confusion? Partner with good causes because it is the right thing to do, not because you can generate a bump in holiday sales. U.S. smoking rates have declined dramatically since the 1950s. Increased health awareness, smoking bans, and tobacco taxes have obviously contributed to the decline. What caused high school student smoking rates to jump in the 1990s? Any ideas? Fiber One Cereal: Profits, Aspartame, and "Healthy" Cereal? General Mills' Fiber One cereal has been around for decades, but recently the cereal notorious at kitchen table confabulations for its resemblance to eating cardboard and experiencing gastronomic purgatory has received an inordinate amount of attention. Given the company's $560 million advertising spending so far this year, the venerable Advertising Age recently ran a piece on the product line at the forefront of General Mills' conquest for the supermarket aisles and kitchen pantries across America: "In the past 18 months, Fiber One has expanded from five items in two categories to 20 items in six categories. Fiber One ready-to-eat cereal alone has seen 2008 sales rise 38.2% to $44.1 million for the period ended Oct. 5, according to Information Resources Inc."
Besides the huge advertising budget that General Mills has devoted to establishing the Fiber One brand, they've also aggressively pursued some creative partnerships. One of which is a book deal with the "Hungry Girl" Lisa Lillien, whose self-professed mission is to trim those pesky muffin tops and provide her followers with some convenient calorie discounts. To clarify, she's not a nutritionist, she's just hungry. In her book, she features Fiber One cereal in "17 delicious, guilt-free recipes." This partnership is one example of the brand's creativity and willingness to generate buzz through social media. What is concerning, however, is that Fiber One's creativity doesn't stop with their innovative marketing--they are being creative with your health too. In a year of soft revenue at the consumer level, Fiber One's strong sales stand out, but driving this juggernaut forward, isn't just their aggressive marketing strategies and pursuit of partnerships, but the fact that their product solves an important need for consumers--providing a healthy alternative to high-calorie sugar cereals that dominate the supermarket aisles. I purchased Fiber One for the very reason described above: I wanted a cereal high in critical nutrients and low in supplemental sugar, so I weighted the nutritional contents and price of Fiber One against Grape Nuts, Raisin and Kashi cereal. Satisfied with my choice of Fiber One, I purchased the product and enjoyed some the next morning. To my surprise, the cereal had an intense sweetness, so I re-verified the nutritional content and confirmed that the cereal contained zero sugar, a strange fact that befuddled my expectations. Further investigation confirmed that the product contains aspartame, an artificial sweetener used frequently in diet soft drinks and linked to various forms of cancer. Adding aspartame to a supposed healthy cereal is an egregious offense which amounts to intentionally deceiving consumers. General Mills and the Fiber One’s marketing organization need to fess up. Their cereal isn't healthy and contains chemicals that have been proven to cause cancer in both humans and lab rats. In fact, female rats fed the artificial sweetener developed more lymphomas and leukemia at a statistically significant level compared to rats that received no aspartame in their feed (Soffritti et al. 2005; Soffritti et al. 2006). The prevalence of cancer in rats grew commensurately with the amount of aspartame in their diets. Another study published in 1996 (Olney et al. 1996) suggested that an increase in the number of people with brain tumors between 1975 and 1992 might be associated with the introduction and use of aspartame sweetener in the human diet. Get with the program Fiber One. Your cereal causes cancer and deceives consumers--I want my money back. Update 5/16: Looks like General Mills' strategy is paying off--according to General Mills' quarterly statements, snack unit revenue is up 15 percent% largely because of "healthier snacks" like Fiber One leading the top line. I've been reluctant to pontificate in the realm of personal finance lately--market conditions are simply too volatile now for me to feel comfortable placing any big bets and I'd be even more hesitant advising others to take specific positions. There is, however, one bet I am willing to make, and it isn't even a bet. CD rates are high right now, especially considering how low the Fed funds rate is and that prices are actually falling, evidenced by the 1% decline in the CPI in October. With the Fed funds rate currently at 1%, rates on CDs offered by major banks are a steal. With the probability of deep recession, it may be 24 months or longer before we see a recovery and in the meantime, prices are likely to continue falling as aggregate demand contracts and the interest rate will remain low. Locking in 4% with a bank like ING makes a lot of sense, especially given that the equity markets have offered a whopping -46% return YTD. And 4% isn't too shabby given that the Fed is almost gauranteed to drop the interbank rate by 50 basis points following their December policy meeting. Comparing the rates available to consumers shown below with what banks can get in the overnight market, locking in an FDIC insured CD seems like a decent idea. After Murdoch's News Corp. acquired the venerable Wall Street Journal in late 2007, there was wide speculation that Murdoch would open up the online version and make it free to all. The Journal, however, still hasn't been made free, even after the redesign this fall. (It's a better business to sell subsciptions than ad inventory to Google.) Luckily for the web-savvy, the WSJ.com is available free to those with a little creativity. All article links coming from Digg.com are able to get around the gate, so if you need to read the "premium" content on WSJ.com, simply Digg that article or do a search on Digg for online.wsj.com with the "URL only" field selected. Go here for a feed of all article as the appear on Digg. There is an anonymous quote in the Wall Street Journal (un-gated version available here) from one individual close to Citigroup matters: "You would think the regulators would want to exercise some leadership and protect the integrity of the financial-services world." What about overpaid executives exercising some of their own leadership and actually fulfilling their fiduciary responsibilities? No matter who you point the finger at for causing the credit crunch (The Fed, Fannie/Freddie, or Wall Street) there is no denying that decision makers at banks bought the toxic assets that are leading to their firms' demise. Hank "The Hammer" Paulson isn't looking so good these days. After months of deciding how exactly to spend $700 billion dollars we've given him, Paulson is changing directions again. In what amounts to a severe leadership deficit within Treasury, Paulson is now focusing the $700 billion blank check on consumers by providing better access to student loans and vehicle financing. That's a great idea Hank--we can save GM and the consumer all at one. An even better suggestion is having the federal government mail out giftcards to WalMart in time for the holidays. Facetiousness aside, Treasury has shown a keen inability to craft an effective and coherent stimulus package. By initially coming forward with a half-baked plan to buy trouble assets, then scraping that idea in favor of providing financial intermediaries with capital via preferred shares stakes, and now pulling out the consumer idea, we are left with little faith in the direction of the bailout and it's potential for success. All this shouldn't be surprising, because by having Paulson at the helm we are asking the very man responsible for creating the subprime debacle to use his lack of judgment and poor foresight to fix the problem he created. Paulson was in a leadership position at Goldman, arguably the center of the financial universe, during the years in which the risky behavior and hasty decisions were executed, getting the world into this mess. A high-flying stock for most of last year, Google shares have made a dramatic reversal as the gravity of the economic crisis hits the "real economy." Citigroup analyst Mark Mahaney joined the herd today and lowered his expectations for earnings growth, citing what isn't a surprise to anyone by now, that the economy is in the tank. Year to data, Google has shaved off a staggering 58% compared to the S&P's 42% drop. It might be surprising to some to see Google getting hammered by the effects of the credit crunch and associated fallout, given that they're in the advertising business. While their customer base is diverse and increasingly international in composition, some of the biggest spenders in search advertising were financial services firms and automakers, two sectors experiencing unprecedented periods of creative destruciton. Wall Street, however, is notoriously short sighted (I think the securitization debacle validates this) and over a hundred billion dollars of Google's value has been wiped away in the last year. Given the company's strong earnings growth, low valuation multiples, and strong position as the provider of the future web operating system, you might be able to pick up some dollars for half off.